Gutter Sizing Guide - SAF - Southern Aluminum Finishing Co, Inc. SAF – Southern Aluminum Finishing Co, Inc. 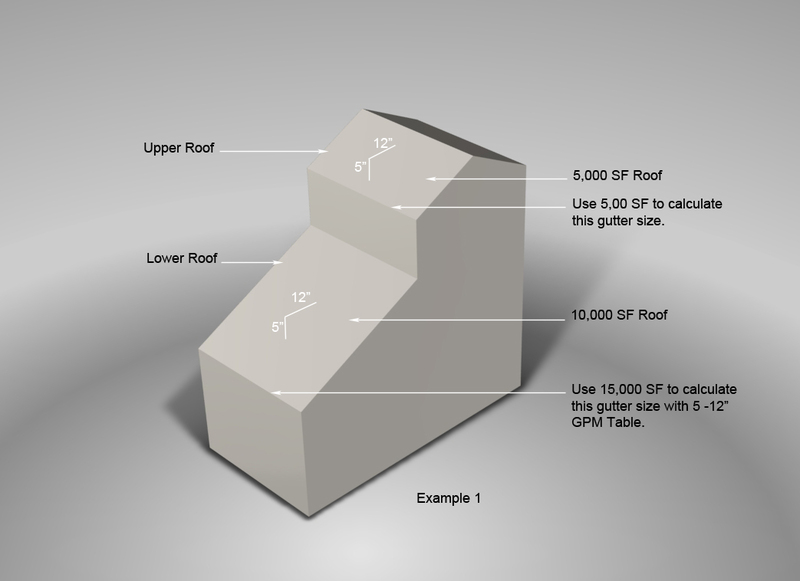 Calculate roof area to be drained by your gutter system and note roof pitches. As a safety factor, always design or select gutters and downspouts for worst case conditions. For roofs levels that drain onto lower roofs; the lowest roof area in elevation should include the area of roofs above, that drain onto it. For example; 1st story roof is 10,000 square feet, 2nd story roof drains onto 1st story roof and it’s area is 5,000 square feet. 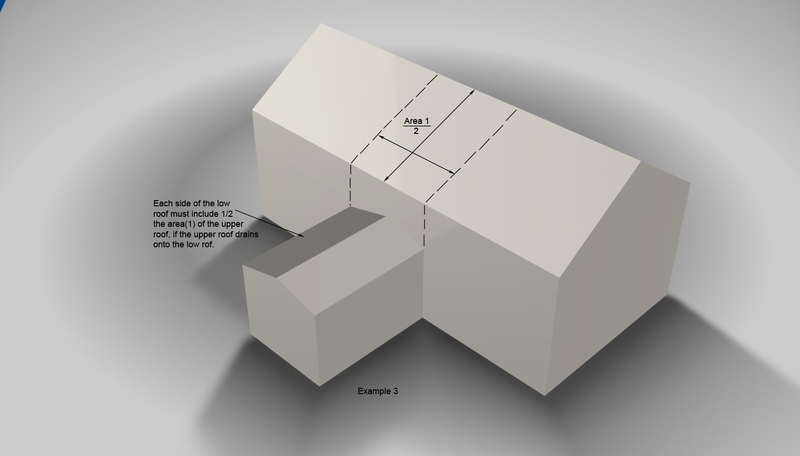 Total area for 1st story roof should be calculated as 15,000 square feet (see example 1, right). 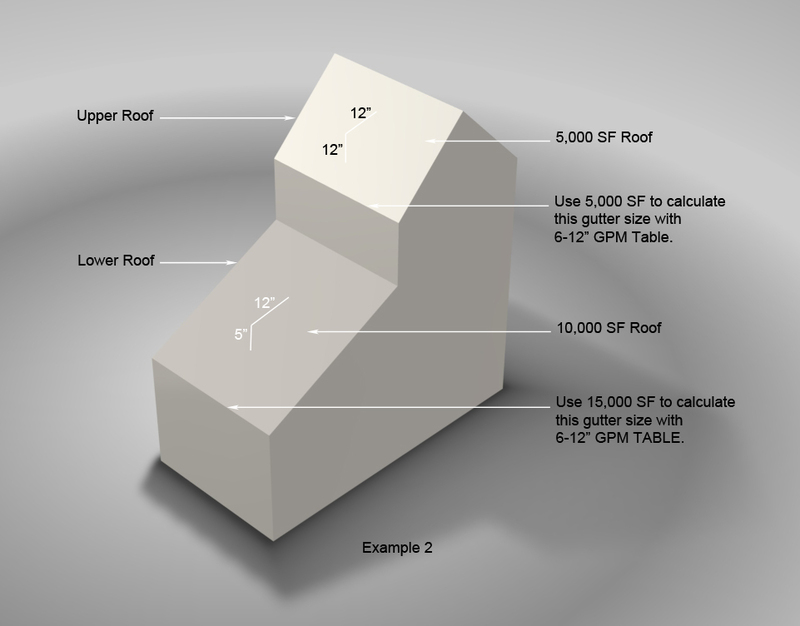 The roof pitch (slope) has to be accounted for when using our GPM tables. Their values are formulated on a roof’s pitch. For multi-story roofs, draining onto one another (as mentioned above), you will select your GPM table based on whichever roof has the greatest pitch. Taking from the example above, 1st story roof has a pitch of <1″in 12″, 2nd story roof has a pitch of 1″-6″ in 12″, you will use the 1″-6″ in 12″ GPM Table for both roof calculations (see example 2, right). For a canopy as shown in the photograph above, you would only take into account the area of the upper roof that drains onto the canopy. Without question you will run into gray areas, when in doubt, please call us toll free 1-800-334-9823 and we will gladly assist you with your sizing requirements (see example 3, right). 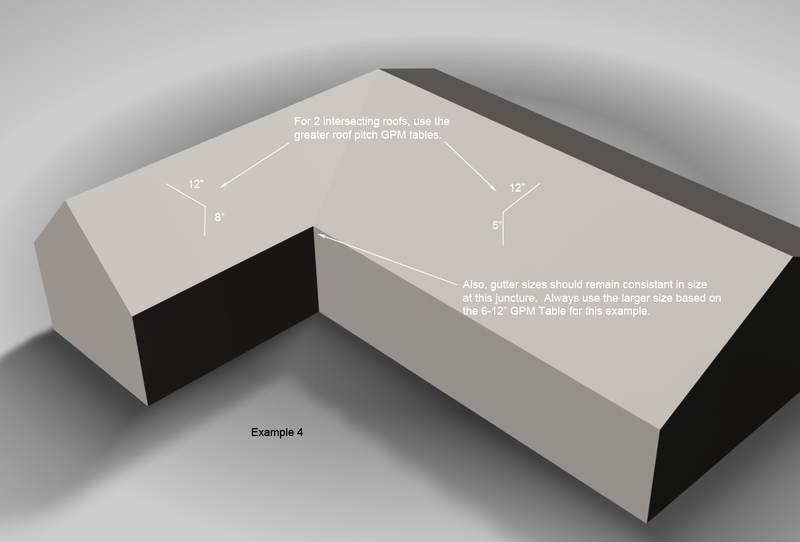 For roofs that intersect at the same elevation with different roof slopes, you will always use the GPM tables for the greater pitch (see example 4, right). NOAA (National Oceanic & Atmospheric Association) has produced historical rainfall Isopluvial Maps (in color) for most of the U.S. These maps may be accessed from the ISOPLUVIAL MAP Links below. The colored maps are a great improvement over the old black & white maps. Unfortunately, due to government budget constraints, mapping for all the U.S. has not been completed. Note: When reviewing data from the NOAA Databases you will need 60 minute duration data to use our SAF GPM Calculation Tables. The SAF Perimeter Systems Roof Gallons per Minute Table (click to enlarge) allows simple calculation of Gallons/Minute/Square Foot of Roof Area. Relate historical rainfall values and calculated theoretical gallons per minute per square foot of roof area, according to a project roof slope. Look up the value(s) applicable to your project and multiply by your total roof area(s) to be drained. For example, assume you are draining a 20,000 square foot roof with a roof slope between 6″ and 12″, your project location’s historic rainfall is 1.8″. Your GPM calculation is 20,000 x .094 = 1880 gpm (gallons per minute). 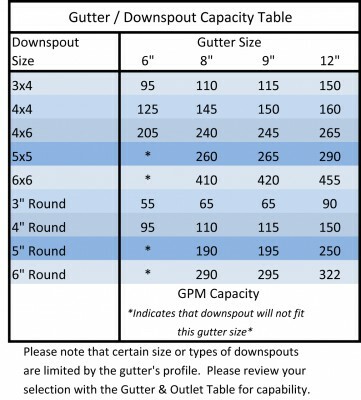 You will use this GPM calculation to select the proper size gutter & downspout in Step 4 – Calculate Water Handling Capacity for Gutter & Downspout Options. 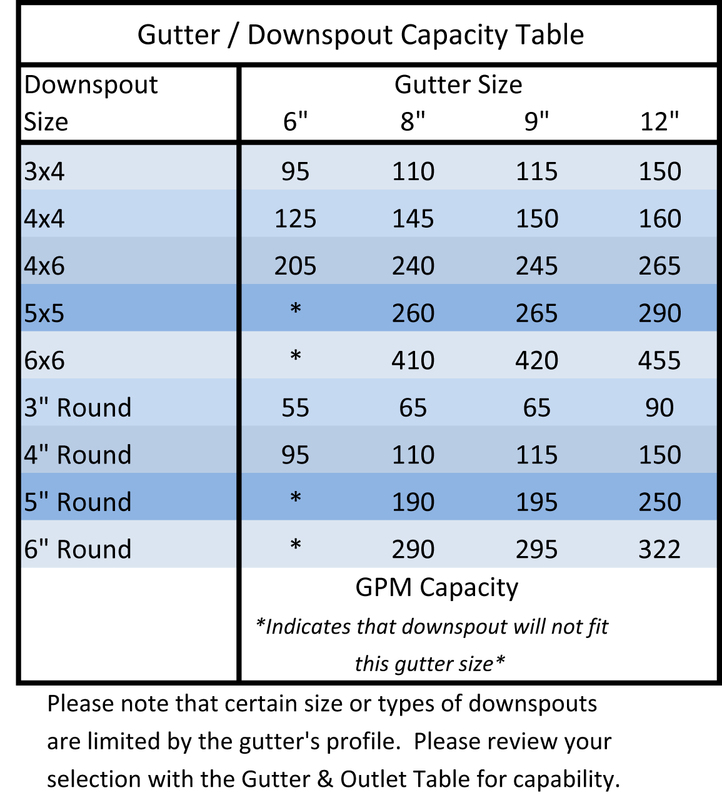 The SAF Perimeter Systems Gutter/Downspout Capacity Table (click to enlarge) relates Downspout Size to Gutter Sizes. Water capacity values of a gutter & downspout system is calculated using the height (head) of water a gutter can hold, the outlet (orifice) size of the downspout, and the quantity of downspouts used. It is possible to use a mix of gutter sizes, a mix of downspout sizes, and quantities to accommodate the theoretical gallons per minute draining from a roof during in-climate weather. Practically speaking though, a common gutter size is usually selected and downspout spacing is equal for most buildings. Continuing with our example in the last step, we know our gutter & downspout system may be subject to as much as 1,880 gallons per minute. For design purposes and aesthetics, let’s assume you have selected an 8″ gutter. Also assume our guttered eave is 335 linear feet. From the table, we find that a 5″x5″ downspout will discharge 260 gallons per minute. At 1,880 gpm’s, we will need 8 downspouts to handle the rainfall (1,880/260=8 downspouts, rounded up). Next we need to check spacing, 335lf / 8 downspouts = 40′ centers (approximate). Note that gutters require expansion joints at 40′ centers. In this example your maximum spacing of downspouts should be 40′. By reducing the downspout spacing to perhaps 35lf, you could use a 6″ gutter with (9) 4″x6″ downspouts in lieu of an 8″ system. It is easy to see that you can vary gutter size, downspout size, and downspout spacing to properly size a gutter & downspout system.